How do undefeated fighters perform in UFC title fights? 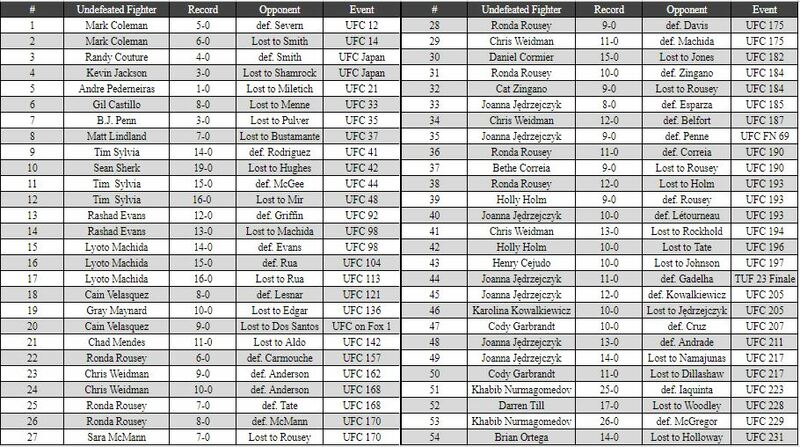 In the history of the UFC, there have been 54 undefeated fighters that were competing in a UFC title fight. In those 54 contests, the undefeated fighter won 28 of them (win rate = 51.9%). If you want to see the data, you can look at the picture below. What this data shows is that undefeated fighters are not at a disadvantage in title fights. A common misconception is that a fighter must taste defeat then learn from that experience and become better, before they develop the skill set to become a UFC world champion. This is not the case!